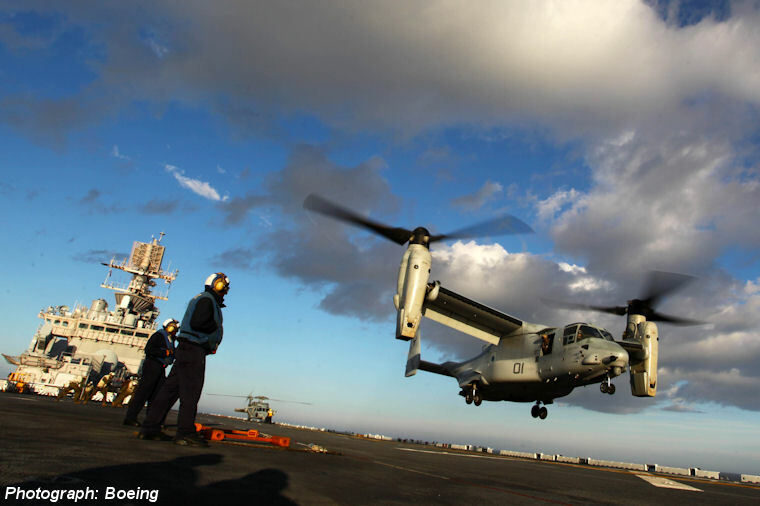 The Bell Boeing V-22 Program, a strategic alliance between The Boeing Company and Bell Helicopter - Textron, announced that the U.S. Marine Corps has taken delivery of the first MV-22 Osprey produced with the new Block C suite of design upgrades. More than 160 Osprey tiltrotors are currently in operation and the worldwide fleet has amassed more than 130,000 flight hours, with nearly half of those hours logged in the past two years. Safety, survivability and mission efficiency have become hallmarks of the operational fleet. 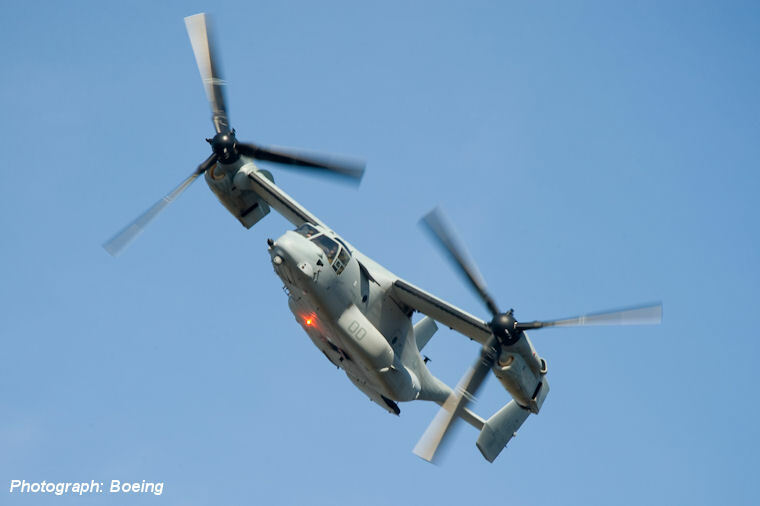 According to Naval Safety Center records, the MV-22 has the lowest Class A mishap rate of any tactical rotorcraft in the Marine Corps during the past decade. Navy flight-hour cost data also show that the Osprey has the lowest cost per seat-mile (cost to transport one person over a distance of one mile) of any U.S. naval transport rotorcraft over the past two years. The new V-22 Block C design upgrade includes a new weather radar system that improves navigation in poor weather conditions, and a redesigned Environmental Conditioning System to enhance aircrew and troop comfort. Expanded capacity and effectiveness built into the Electronic Warfare system including additional chaff/flare dispensers increases the Osprey's ability to defeat air-to-air and ground-to-air threats. The Block C also provides greater situational awareness with enhanced cockpit and cabin displays. “The Block C aircraft is the latest milestone in Boeing's on-going quest to make the world's most revolutionary aircraft even more advanced," said John Rader, executive director of the Bell Boeing V-22 Program. "Block C Ospreys will meet our current customers' enduring need for the latest mission capabilities, while presenting an even more compelling value proposition to future domestic and international customers." “We continue to increase the capabilities of this first-of-type tiltrotor, and Block C is the latest, evolutionary step,” said Marine Corps Col. Greg Masiello, Joint V-22 Program Manager, Naval Air Systems Command. “Whether it's the addition of weather radar, upgrades to the environmental control system, or improvements for situational awareness, Block C brings enhanced capability to V-22 pilots, maintainers, and crew members throughout the aircraft's life cycle."